Best In-House Recruiter qualification available. Best In-House Recruiter course. Best In-House Recruiter course. Best Internal Recruiter qualification. Take the best In-House Recruiter Qualification trusted by recruiters in global companies. Delivered by tutors who have worked in recruitment for both SME’s & international companies. A superb practical course that gets you work-ready. Book your place now! Earn the letters 'Cert PRP' after your name. You become Part-Qualified in HR. 7 units of study created by industry experts. This course is delivered entirely online via a state of the art learning centre. Ideal for UK and international recruiters. Free individual membership of the Institute of Recruiters is included. This course is at Level 3 & takes 3 months to complete. This qualification is suitable for anyone looking for an exciting career as an In-House Recruiter, and those already working as an In-House Recruiter wishing to get qualified in the role. This qualification has been designed to be delivered entirely online to learners who may need to balance learning with a busy work schedule. It will also allow learners to apply new practical skills to their work environment while they learn. Training will be delivered via online webinars which are split into handy bite sized sessions over a 5 month period. Alongside these webinars learners will also receive a comprehensive ‘self study’ handbook. The handbook will provide in depth knowledge and practical exercises which learners can undertake within the workplace. Training will be delivered via online webinars which are split into handy bite sized sessions over a 3 month period. Alongside these webinars learners will also receive a comprehensive ‘self study’ handbook. The handbook will provide in depth knowledge and practical exercises which learners can undertake within the workplace. No prior entry qualifications are required for this qualification. Do I get letters after my name? 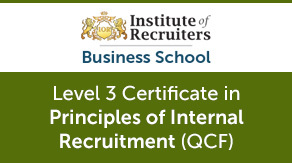 This course is officially recognised by the Institute of Recruiters (IOR). On completion learners earn IOR membership and the professional letters ‘Cert PRP’ after their name.